Longtime readers know that almost every recipe I make on this blog uses lactose-free dairy products. I don’t often highlight that fact or mention it in recipes because I don’t want to pigeon-hole myself into running a lactose-free blog. And while I use regular milk for recipes that only I will eat (thanks, Scandinavian heritage for ensuring that my body can process milk! ), anytime I’m making something to share with Gabe, I make it lactose-free. Every once in a while I want to call attention to that fact, since the invention of lactose-free milk has made my cooking life immeasurably easier and more satisfying. I no longer need to figure out how to use chalky soy milk in recipes where dairy is the star, like creamy soups or homemade ice cream. 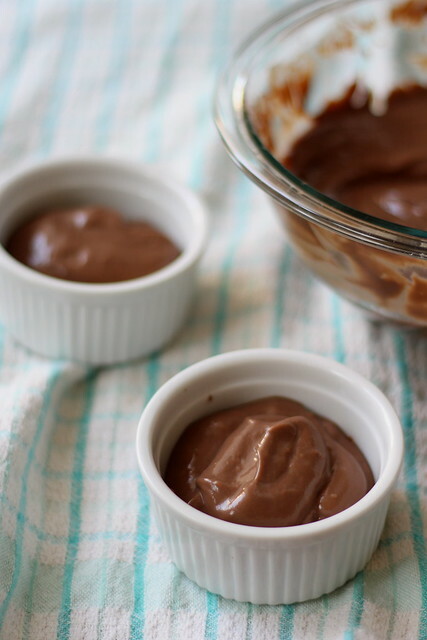 Or rich, chocolate pudding. I’ve never made pudding from scratch before, but it’s kind of magical. I felt like I was stirring, stirring, stirring, waiting for the chocolatey goodness to thicken, and then BAM! Suddenly I had a custard. So give it a whirl, whether you go lactose-free or not. P.S. I decided to make pudding because I had four egg yolks left over from a batch of homemade marshmallows. They’re a perfect pair! In medium saucepan, whisk together sugar, cornstarch, salt, and cocoa. Very slowly (about 1/4 cup at a time) whisk in milk, trying to remove as many lumps as possible. Whisk in egg yolks until smooth. Meanwhile, place a fine mesh sieve over a medium bowl and set aside. Place saucepan over medium heat and slowly heat chocolate mixture, stirring constantly. It helps to alternate between a whisk and a rubber scraper, so you can keep the pudding smooth and prevent it from sticking to the bottom of the pot. When the pudding just barely starts to boil, reduce heat to low and continue to stir constantly for 3 minutes until very thick. Remove from heat and pour through sieve into the medium bowl. Stir in butter and vanilla until smooth. Cover with a piece of plastic wrap, sticking it directly to the top of the pudding to prevent a skin from forming. Chill in refrigerator for at least 3 hours. Remove from refrigerator, stir, and serve in individual bowls. Source: Very slightly adapted from Martha Stewart. This entry was posted in Dessert and tagged chocolate by krista. Bookmark the permalink. This is One of my favorite things to eat. Like to suggest to add some garnishing things like almond, walnut to enhance it taste. Many thanks for sharing.